The scholarship is presented to students who demonstrate the tenacity and courage to follow their educational dreams. 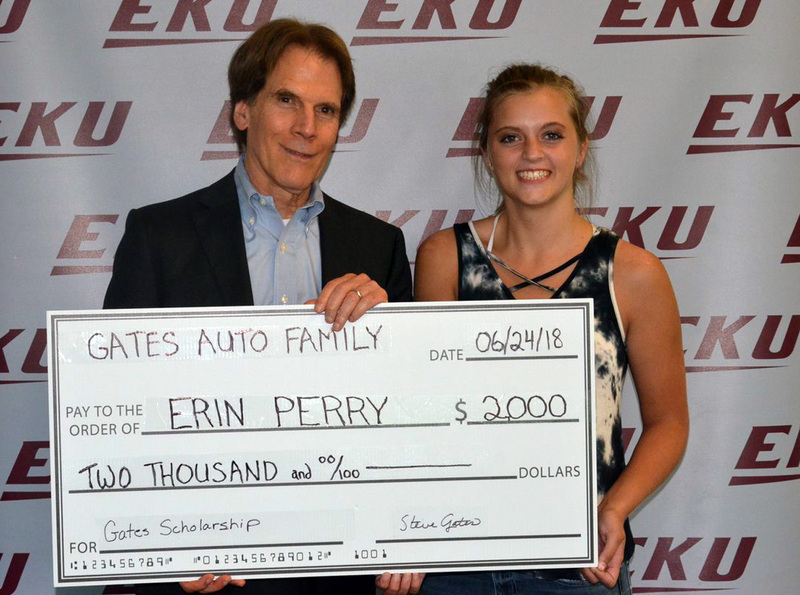 Perry, who successfully completed three years of Upward Bound, will attend Hazard Community College this fall with the intention of transferring to EKU to complete a bachelor’s degree in nursing. Steve Gates, owner of Gates Auto Group, and his wife, Kathy, presented the inaugural scholarship at a recent EKU Upward Bound event on the Richmond campus. Gates said that Perry possessed all the characteristics needed to be a successful first-generation college student. He also offered the scholarship recipient an employment opportunity to further assist her with obtaining a college degree. For more information about the EKU Upward Bound program, contact Tamara Stewart at 859-622-1080 or at tamara.stewart@eku.edu, or visit www.upwardbound.eku.edu.